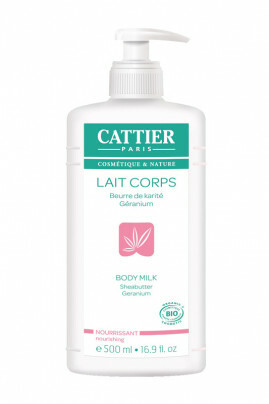 Cattier Organic Nourishing Body Lotion with Geranium moisturises, soothes and intensely nourishes dry to very dry skins. Enriched with essential fatty acids, essential oil of geranium and sheabutter, it prevents cutaneous dryness, smoothes and softens the skin while wrapping it in a protective and delicately scented veil. CATTIER Nourishing Body Milk protects your skin ! Apply generously all over body concentrating on drier areas. Massage until complete penetration. CATTIER Nourishing Lotion for Body delicately smells geranium fragrance !